Having trouble growing fig trees and getting fruit. Whats the process? Not necessary. Depends on that kind of figs you have. My MBVS figs are fruiting, I bought the cutting from ebay. My violette de bordeaux hasn't fruit yet and it's aready 2 years old. The only thing I need to do it spray them with copper fungicide every now and then, and fertilize it with 10-10-10 fertilizer and it's doing okay so far. Here in Vegas, they grow like crazy with just some occasional watering. They basically thrive on neglect beyond that. It is, however, really hot and dry here, so if you're somewhere where it's cooler and more humid, you'll want to water it less and make sure it gets full sun. LSU Purple should be good for hot humid climate like Florida so I bought one. Anyone in Florida have a personal report on LSU purple? I grow a few in large pots here. I remember when I looked for varieties I looked for “small eyed” varieties because of the humidity. The fruit enough for me. They get mildew late every summer but eventually lose their leaves and all good the next spring. They grow pretty easy, fruiting though.... you got me. I heard if you pinch the tips off they put more energy into fruiting, it worked for my Peter's Honey, the one I pinched has more/bigger fruits than the one I didn't. It can also depend on variety, after being tipped my Black Mission just stopped doing anything for a while, now it's starting to branch out but no signs of fruit. Unlike most plants, figs actually like having their roots constrained. I have had figs for 6-7 years and as mangomaniac said they are meant for Dry hot climates. I have around 9 varieties now including the LSU purple, LSU gold, LSU champagne and LSU black. Unfortunately the majority of figs ripen in our rainy season and they are washed out flavor wise. November. They had honey dripping out of the eye and were the best figs I have ever eaten. My figs are in the ground and I add compost and manure and coffee grounds. away constantly and its clean and perfect. Every winter or early spring you should trim the white branches. were ok but nothing compared to when I ate them in November. figs on it and they have always gotten ripe in the wettest time of the year. By August it is done and not everbearing? and this year I should be able to try them for the first time. 1) are you having a hard time growing them? 2) are you having a hard time getting them to bear fruit? There are hundreds of different cultivars if figs, and you can find varieties for each climate. One popular one right now is colonel littman’s black cross which I believe originated in Florida. You will have to do some research to figure out which ones are best for your climate as they really do seem to be picky re climate. Yes you can zone push, but you may not get ideal growth, or you may get fruit at the wrong time of year. There are also some varieties that are outstanding but just don’t perform in certain areas. A fig guru I have been getting advice from recommended against the raspberry latte fig saying that most of his fruit from that cultivar formed odd figs (fig in fig) that had no flavor in his area of California. There is a very prominent fig forum out there where you can find very expert advice in addition to what you find here. Buyer beware: lots of fig scammers on eBay. The forum I mentioned above has a working list of trustworthy vs disreputable vendors. There is also a dedicated fig bid website. I have an LSU Purple, Two LSU Golds and a BROWN TURKEY . The LSU varieties are in a 5 gallon Home Depot bucket with the bottom cut out and are planted in the groung theu are now two years in the ground and hane grown to about 5 feet and hsve no fruit but look healthy. Also there is an old Celeste on the ptoperty the I pruned back last winter and it is full of smsll figs but they sre not getting larger, it is in the groung and is about 5 feet wide and 4 feet tall. The only star is a brown yurkey that is in about a 25 gallon ceramic pot that is fruit well and have sime large fruit. All tre were mulched the the low cost red mulch when Lowes had the dollar a bag sale in the spring. For some reason that is anout the same time the in ground figs shut down growing. I regolarly fertilise and I water them and dump corree frounds om them weekly, forst one hen the next week the other and so on. The leaves are showing signs of rosr on the brown turkey. Those dyed mulches are commonly made from recycled wood pallets. When the chips break down they can release toxic chemicals into the environment. Arsenic from the CCA is common. If your soil has root knot nematodes, you won't have any success growing fig trees. This applies to my sandy South Florida soil. I was hoping that was not the explanation but you are probablt correct. I recently pulled up some everglades tomatoes ang the roots were heavily infected with nematodes. These are fruiting a little in Ecuador wet humid climate. I would suggest replacing the bottom soil, giving them plenty of nutrition, I mainly use my fermented pee and compost as dressing or at the bottom of the pot. Ive only had a few ripen perfectly. Just a few years in though. I'm currently growing Black Madeira and Gallicia Negra, both are growing in 15 & 25 gal. containers and doing fine, they average about 5 to 6 ft in growth a year for me. I use self feed Miracle Gro soil in the cont. and occasionally feed liquid Mirc. Gro food. The Black Madeira produces a very heavy Breba crop, while my Galliacia Negras only produce a few in old growth,both are great growers here in West Central Florida (Tampa Bay). My hardest to grow ere has been the Black Madeiras I got from U C Davies, they are almost impossible for me to grow them. I have not tried growing them in the ground, but i will put a plant in the ground this year, just to see how it does. These are Pics taken Today. I've had figs in certain parts of my yard that have died or gotten near dead. The near-dead ones, once removed from the ground and then potted, all bounced back nicely. Then when placed in other parts of the yard, sometimes take off. Here is my biggest best growing Brown Turkey (fenced off to keep my dogs from chewing the tree). When I lived in Largo, FL, the best grower and producer was up next to a Queen Palm and I think the palm fruits really helped it. So for me, growing figs in hot and humid FLA has been a process of searching out just the right spot. When found, they do well. I do have a young LSU Gold in a pot, as well as the Brown Turkey figs. added manure and let this stuff sit for 6 months and it turns into the best black compost you could want. and it will quickly in the rainy season. Keep adding good organics, I prefer to fertilze the figs with manures. but here in Florida the biggest fig I have seen is 15' celeste and it had rust all over it leaves in the summer. Very good to know. I have been told the same about desert rose. Thanks to all Florida fig growers for contributing their fig growing experiences. I have brown turkey and Ischia planted in a bad location and have gotten bland figs, good figs and winter figs from them but low quantity. These two plants are neglected. My new purple LSU is container grown. Good video on why Ficus palmata/carica hybrids are the solution for nematode-afflicted soils. And some cultivars like Hava and Digger's Purple Heart are extremely good tasting. Both my LSU purple and gold figs are growing one shoot mainly. Just got 4figs from the gold, funny looking as the bottoms are flat. My only source of manure os black cow so I will buy some and pile it on. Celeste full of figs but small, all this rain might help. Interesting, I haven't investigated F. carica hybrids. 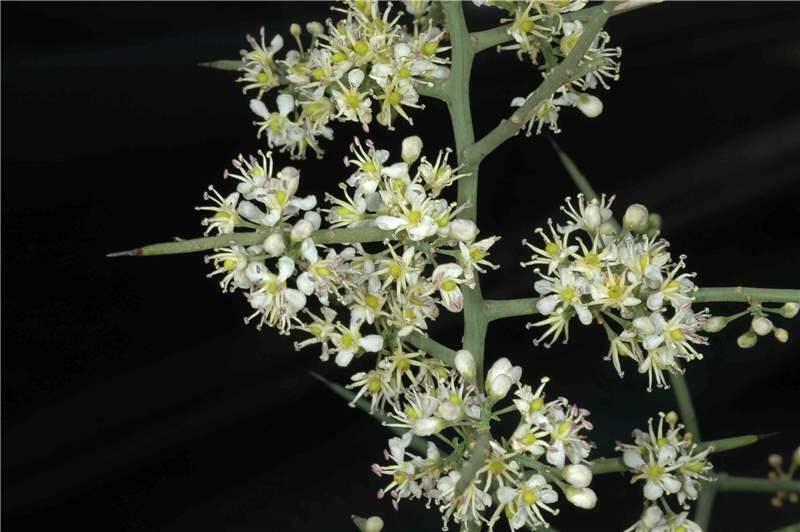 One thing I have investigated is grafting (I was hoping that it would be possible to graft F. carica onto F. religiosa, to get the aesthetics and significance of the former while actually getting a useful fruit). But apparently ficus are difficult to graft outside of their specific tribe (and even within their tribe there can be incompatibilities). If I remember right, the purpose of the studies I was looking at was testing grafts with F. carica on different rootstocks to increase nematode resistance. Not so sure about that.... 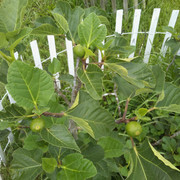 Check out Ourfigs.com and you'll find Fig lovers growing figs in all kinds of regions, especially tropical. Thailand has a bunch of ourfigs members doing extremely well. 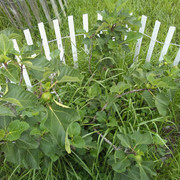 I'm interested in growing a fig tree in a 20 gal container here in S. FL. I'll be following this thread looking for what variety would be best suited for my climate.